The Cozzinses lived in Richmond, Virginia, in 1865 [at the end of the Civil War]. Lizzie Watson, sister of Martha Ragscale, was at Burkeville, Virginia, in 1870. 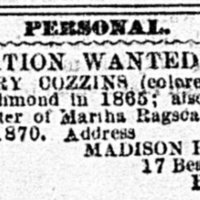 “Madison Harris searching for Susan Cozzins, Henry Cozzins, and Lizzie Watson,” Information Wanted Ad, Richmond Daily Dispatch (Richmond, VA), February 23, 1876, Last Seen: Finding Family After Slavery, accessed April 19, 2019, http://informationwanted.org/items/show/3306.